We are doing a reading in a cinema. Legendary LONGPLAY which has a cinema behind its bar. Books and zines for sale at crazy prices! Join us for the opening of Mingus Gallery. A new community art space in the heart of Hepburn Springs. The opening will feature comic line art by Eric Yoshiaki Dando and mixed media drawings / paintings by Stephany Panhuysen. howie drives his new car over. it is a rusty holden and he has carefully painted ‘driving for jesus’ on the roof in big green letters. he says, ‘this is so god can look down and show mercy in road accidents and heavy traffic.’ on the back window is a collection of rainforest slogan stickers. it is an unusual combination. howie has started to look a little bit like jesus, with his hair all long and his attempted beard and his hippy shirt. i plan to paint ‘jesus is driving’ on the bonnet in big green letters. he tells mary and i that ashton’s circus is on tonight in daylesford and why don’t we all just drive there and why don’t we all chip in and buy some alcohol for the journey? our local hotel is full of animals. we’ve never been inside, we just believe what we see through the windows. we buy island coolers form the drive-in bottle shop, so we don’t have to get out of the car. we can roll the windows up if we need to, howie says that it’s like driving through the bulleen african lion safari. we are passing through bulleen past the actual ghost of the old bulleen african lion sufari park, you can still see the zebra stripes on the public tiolets. my parents took us there on trips to melbourne. you just drove your car in there and lions would jump on it. howie keeps leaning out the window and screaming the botanical names of trees we pass along the highway. it is very unsettling for me and mary. ‘look, exocarpos cupressiformis,’ he jabbers wildly as i grab the wheel. the more howie learns about the bush, the more he discovers what is wrong with it. he realises that the world is completely fucked. that merri creek is only one vein in the country’s circulatory system and it is dying. the thing about bush regeneration is that it is like a religion to some people. it attracts mad extremists, environmental terrorists. martyrs for the cause. he is becoming weary, heavy-eyed, his voice breaking off at the end of each sentence. one more island cooler and we will wind up burned beyond recognition, twisted around some tree that howie knows the botanical name of. i am extremely alert, ready to grab the wheel at any time. there’s a shitface selling hot dogs and all the clowns are smiling and there are no mondays here. everything is big top, everything is saturday. there’s popcorn, fairyfloss, fat lady on a stool. a lion jumps through a hoop of fire, three rings and a high wire. mary eats her doughnut and says it’s really terrible what they make those lions do and howie looks at the hoops of fire and the cogs are whirring and the wheels are spinning and he says that it’s really terrible too. we follow him out the exit and jump into his car and then the lion-tamer comes running out into the carpark like he’s looking for something. he’s holding his whip and bending it in the middle like he wants to kill someone. howie starts his engine and we roar away. but howie is righteous, triumphant. he points his finger up at the sky, stamps his foot on the accelerator. ‘orders from above,’ he says in a high, toffy voice. all debate is drowned by his preaching. he looks over at mary for some approval but her face is dead tight and she is all hunched up against the door. she slowly repeats, ‘slow down, howie. just keep your eyes on the road, howie.’ she shakes her head like she can’t believe she is letting this lunatic drive us home. she’s not talking to anybody, she is not listening to howie’s sermon about a magical universe. the hedgeburning continues. it’s in the newspapers, neighbourhood watch is in uproar, residents are living in fear. the television has turned the hedgeburner into a sort of folk hero. someone has put out a hedgeburner t-shirt. now we thrill to the sight of a smouldering hedge, as if we have caught sight of elvis or jesus christ. this is only the beginning. soon there will be a whole range of paraphernalia: teatowels, board games, hedgeburner cordial. the newspapers have suggested, with the help of psychologists, that the hedgeburner probably masturbates in the bushes while watching his hedges burn. albert goldman will write his biography. howie has new tattoos: a lion and some japanese letters. he says that the letters mean ‘luck’ or something. i tell him that the letters could just about mean anything. i tell him that they probably mean ‘get fucked’, and one day a gang of japanese exchange students will attack him with a meat cleaver. with readings from Eric Yoshiaki Dando, Julie Koh, Melissa Howard and Stephanie Barham. Really excited (but also a bit sad) about this last short story anthology from Sleepers Publishing. 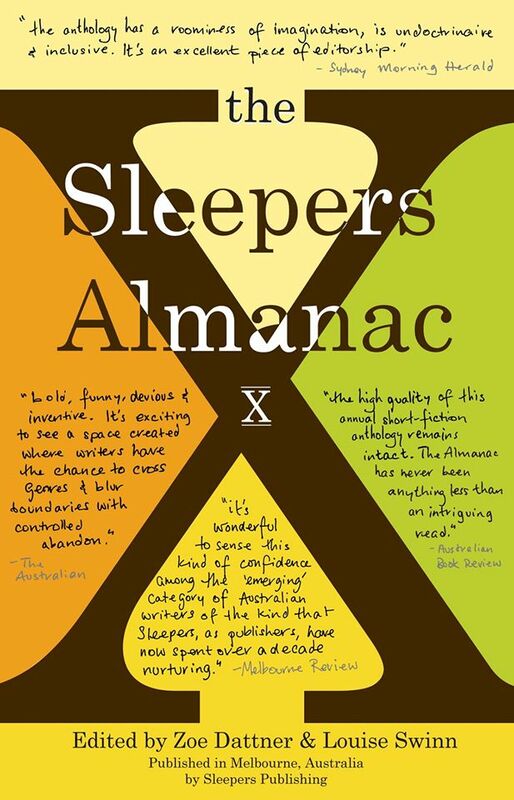 It just wont be the same without the Sleepers Almanac. My new story Space Monkeys Drink Tang! will be my seventh piece of fiction they have published over the years. Sometimes we would just go and hang in the little cafe opposite Camberwell Market and there would be these little terrariums on each table and we would stare at the miniature figures inside while we waited for our coffee. Inside each microcosm the little people would be frozen in perfect moments — like running towards each other while deeply in love or fixing a tyre together on a tiny bicycle in a terrible fog or climbing up a mossy hill to have a romantic picnic on the other side in the beautiful sunshine with nobody else around for miles and miles. I stared deep into the glass and before long I saw the future, and I forgot what we were talking about. I was a world away. When I looked up she was staring at me blankly. I wasn’t sure if she had asked me a question or not.